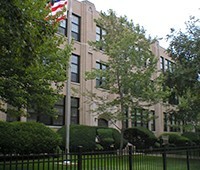 St Ferdinand School, in Chicago is a Pre K-3 through 8th grade educational institution serving over three hundered students. Our students are 95% Catholic and 5 % non-Catholic. We serve families who come from over twenty zip codes. Our main zip codes are: 60634, 60639, 60641 and 60707. Forty nine percent of our families qualify for free or reduced lunch. Our vision of a St. Ferdinand student is someone who exhibits self-esteem, understands and lives Christian values and sets realistic goals. The students will respect themselves and others. In order to realize their potential, our graduates will strive for knowledge and skills through the use and development of critical thinking and decision-making. Students will value learning as an ongoing life experience and will take responsibility for others using their talents to address concerns in the community. We offer many enrichment activities to serve the whole child. After school clubs, choir, altar serving, boys and girls sport programs, and cheer leading are just a few. Before and after school programs are also provided to better serve the working community of parents that we serve. You will find our extended day students engaged in tutoring, completing homework, creating crafts with an instructor or engaged in other activities. The whole community is invited to participate in events like the Pancake Breakfast, Breakfast with Santa, weekly school Masses, the Christmas program and Living Stations.